The Consumer Product Safety Commission (CPSC) estimates there are 5,740 hospital emergency room injuries a year caused by snow blowers. The CPSC reports 19 deaths since 1992 from using snow blowers. Five deaths were caused by carbon monoxide poisoning because someone left the engine running in an enclosed area. The American Society for Surgery of the Hand, reminds us that accidents can happen when using a snow blower. Never put your hands inside the snow blower chute for any reason. If the chute becomes clogged with snow (or another object), turn it off, wait for all moving parts to come to a complete stop and then clear the chute with a stick. It may be frigid outside but don't risk not shutting off your machine to clear an object, because once you clear the obstruction, the parts will start to move again! Dress properly for the job. Be sure to wear adequate winter clothing and footwear that will improve footing on slippery surfaces. Wear safety glasses, and avoid any loose fitting clothing that could get caught in moving parts. Be careful of long hair. Wear ear plugs or other ear protection - they are loud! 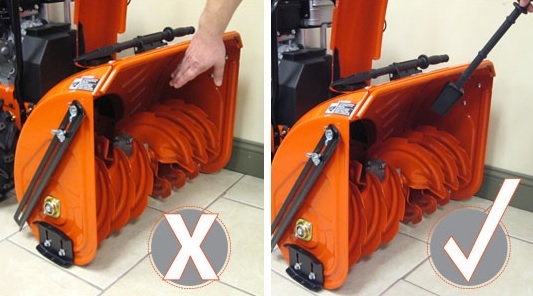 Remove debris and other obstacles (door mats, toys, decorations) the snow blower might strike or throw, as they may cause injury or damage to the snow blower. Wisconsin residents, contact an R&R knowledgebroker about your current home and auto coverage, or any questions you might have for us at R&R Insurance!